Sunday, August 2nd, was a special day. In one fell swoop, I wrote 90% of the lyrics for my latest song parody. The flow of thoughts that morning was splendidly smooth. What did I write about this round? 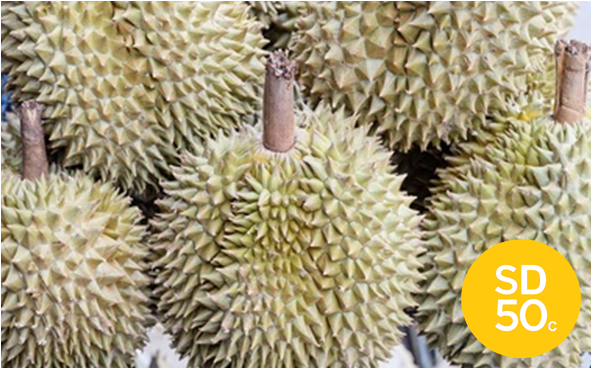 As I hinted on Facebook recently, I had this idea for a song about durian. Yes, it’s that thorny king of fruit which some of us adore and others abhor. Best part is, there’s this old National Day song whose tune fits perfectly. And so this special WittyCulus song is born, days before this year’s Golden Jubilee. I’ve called it my SD50c tribute — the reasons will become clear later — to all durian lovers in Singapore. It took a few more days of tweaking to complete the lyrics to my satisfaction. And do a bit of research too. I also started to think about where to get the music, what images and captions to use, how to record the vocals, etc. Yes, I want to make a video and release it on YouTube. This will take a while more, so here are the lyrics to get you up to speed first. I’ll update this post when the video is done. But how come we still don’t have that prize called mao shan wang? With all the SG50 promos going on, I thought I’d add my own spin. So, SD is for “Singapore Durian”, the title of the song; while 50c is a play on the jubilee numerals, referring to the price of really cheap durians. There’s even a logo for SD50c, as you will see later in the video. Oh, before I forget, the song I parodied is “We Are Singapore”, the original version released in 1987 and frequently seen on TV. For those familiar with how I work, or rather how my brain tends to wander, I’ve already started thinking about the extended version of the ND song: the one people sing today and includes The Pledge at some point.